In recent years we have been experiencing major climate changes and our buildings are undergoing major changes in temperature. This causes movements between different building materials. Of course, the larger the building, the more these movements can result in changes to the interior environment. In order to avoid breakage of insulating links between the building structure and doors and windows, Adfast has developed its new Adfoam Flex insulation foam. With an elongation at break of 36 to 38%, Adfoam Flex is one of the most flexible polyurethane foams in the market. Due to its high flexibility, Adfoam Flex offers increased durability over time and prevents leakage of air or water. Adfoam Flex will therefore reduce your energy consumption considerably for several years. In addition, Adfoam Flex contains only 2 g/L of V.O.C. (volatile organic compound) which significantly reduces the ecological footprint. All our insulating foams are also CFC (chlorofluorocarbon) free. 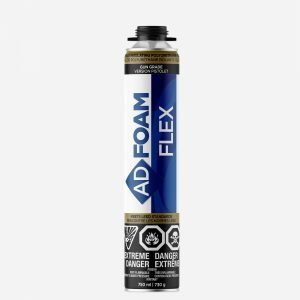 Where to apply Adfoam Flex? Adfoam Flex is suitable for construction applications such as the installation of doors and windows or any other cracks requiring insulation. Adfoam Flex can also be used in the window and door manufacturing, transportation, HVAC, building materials, prefabricated houses, machinery, agricultural machinery or any other market. On which materials can Adfoam Flex be applied? Adfoam Flex adheres to a multitude of materials including aluminum, steel, wood, some plastics and masonry products. If you want to be sure Adfoam Fireblock will adhere to the material you want to use, please contact your technical representative who can do an adhesion test for you. To avoid degradation, all polyurethane foams must be protected from ultraviolet rays. To do this Adfast offers a complete range of sealant. Sold under the Trademark Adseal, our sealants are available in silicone or hybrid versions. If you cannot apply sealant, it is recommended to apply a coat of paint on the foam insulation. Which Adfoam product is right for you? Adfast offers a complete range of insulating foam. With over 30 years of market experience, Adfast technical representatives will be able to advise you. Before starting your projects do not hesitate to contact us.